Do you collect SLOTCARS? Then check out our slotcar site by clicking HERE. You'll be glad you did! Welcome to Good Old Toys! We've got a variety of collectible toys and other items for sale, mostly from the 60's along with a few newer and older items. Browse around and you might find some things you just must have. Most of all, have fun! Evel Knievel Stunt & Crash Car, Ideal, 1974. Includes 2-piece launcher 'energizer' that attaches to car. Crank wheel to rev car, then release car to do daredevil jumps, balancing stunts, and crash-apart finale. Missing Evel Knievel figure. Box measures 19"x9.5"x4.5". 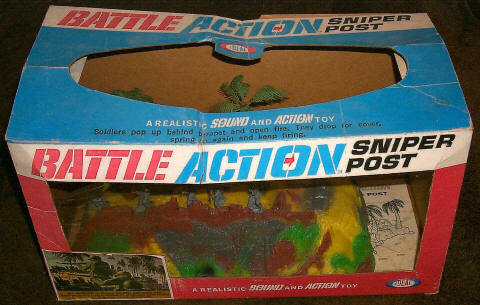 Ideal Battle Action Sniper Post Playset, 1965. This is one of the most desireable and hardest to find of the hard to find Ideal Battle Action playsets. Soldiers pop up behind parapet and open fire with realistic sound. They drop for cover, spring up again and keep firing. Spring motor operated, with no batteries required. 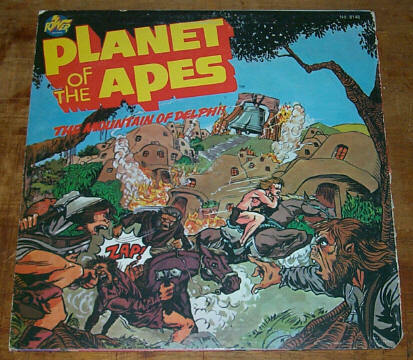 Includes colorfully factory painted display base, palm trees, 5 fighting men, instruction sheet, and another piece of paperwork that came with the toy. Complete with display window box measuring 19.5" x ~10" deep x 10.75" high. Box top has some creased areas in center. Missing top clear window plastic, and front window has a section torn away yet is still present. Would be easy to restore clear plastic windows. Sold. More items yet to be listed can be found by clicking here in the 'old toys' section. Photos upon request. 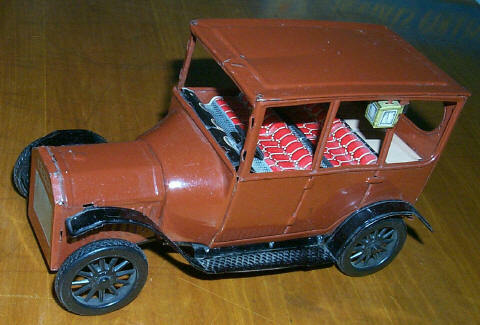 See our frequently updated Ebay Listings Here for many vintage toys and slot car items. Mattel Farmer in the Dell 1954 tin toy. This old toy looks good and has no rust, however it doesn't play music or turn the turnstyle when you crank the handle. Comes with the original box in very nice shape, which is the hardest part of this toy to find.